Many real estate forecasters tend to speak about the arrival of a bottom in the U.S. housing market as an answer to everyone’s woes, but a look to the past shows that may not be the case. 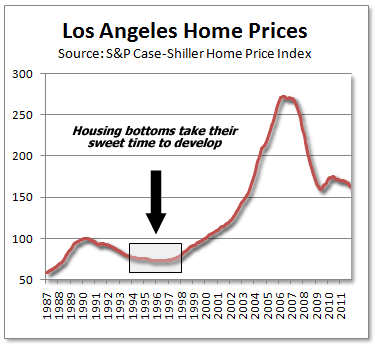 Analyst Tim Iacono references economists Robert Shiller and Barry Ritholtz in a discussion about the dip in Los Angeles home prices in 1996. He notes that prices stayed low for four years following the dive, suggesting that any bottom that may come in 2012 will likely not be the answer everyone hopes it will be – at least in the near term. For more on this continue reading the following article from Tim Iacono. Not surprisingly, I’m going to have to agree with both Yale Economist Robert Shiller in this Business Insider interview and Barry Ritholtz at his Big Picture blog in arguing that a housing bottom – if it does indeed arrive in 2012 – will prove disappointing for those expecting gains on their real estate investment in 2013 or 2014. We happened to be living in Southern California at the time and had the good fortune to buy a house there in 1995, though, we were just looking for a place to live, not thinking of it as an investment. I remember the price actually declined by another five percent or so in the year after we bought it and it wasn’t until five or six years later that we began to hear about rising home prices, a bit surprised to learn that the value of our place had increased by $100,000 or more. But, for the first few years, you were better off not even thinking about home values. Using the broad Los Angeles price index as an example, even if you had bought at the absolute bottom in February 1996, you’d have had less than a one percent gain a year later. The index spent a full four years within five percent of the February 1996 low! Anyone thinking that a housing market bottom in 2012 means that home prices will be higher next year or the year after that will probably be disappointed. Moreover, given the size of the recent boom and the likelihood of the bust being of similar magnitude, I wouldn’t be surprised if home prices don’t post a substantive advance for the rest of the decade. It's certaily not a panacea but when you look at some of the charts at the local level it's hard not to think that there is a solid bottom in place. Take a look at this chart in a nice suburb called Birmingham in Michigan and tell me where you think this is going.